AntiGravity began in 1991, in NYC as a confederacy of gymnastic athletes, who yearned to continue their love of the flip after their competitive years. 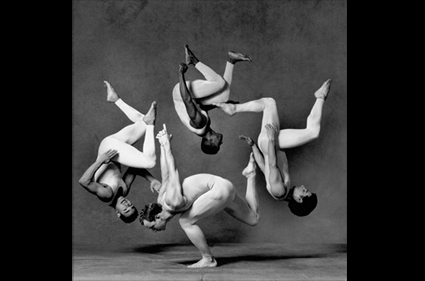 Assembled by world-class gymnastics specialist and Broadway dancer Christopher Harrison, his style merged athletic power with the creativity of dance. Together, Team AntiGravity became American pioneers of contemporary acrobatics and the aerial arts. AntiGravity has a rich history that spans all aspects of the entertainment industry, from Presidential Inaugurations and Olympic ceremonies to international ad campaigns and rock tours, from the top TV award shows to NY nightlife to the elite art houses across the globe they have been prolific at influencing pop culture with their form. Along the path Christopher made numerous discoveries about the body and the mind, which he compiled into a methodology and philosophy now practiced around the world. His health and wellness creations are known as AntiGravity® Fitness techniques.Now considered a leader in the global expansion of the field of movement, Harrison's groundbreaking creations and kinetic inventions have inspired health and happiness through innovative performance and exercise techniques around the world.